If you are looking for minibus hire in and around the town of Bournemouth – look no further than us here at Bournemouth coach hire (www.coachhirebournemouth.com.) 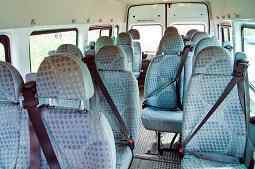 We are the best minibus hire company for miles around for a number of reasons. For one thing we really care about our customers needs and our positive testimonials from satisfied people who have used our services definitely reflect this. There are many reasons why you are visiting Bournemouth, perhaps you are celebrating a stag or hen night? You might be organising a school trip or are just on a day out with family. Business or pleasure – work or leisure, we cater for everybody and meeting our customers’ needs are always our number one aim. 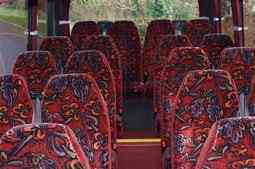 We have a large fleet of vehicles to choose from, 7 seater minibuses, 72 seater coaches and everything in between. This means that you should choose us no matter how many people you are travelling with. Using our services is very cost effective and means that all passengers will get where they need to go and home again safely. The quote will not change no matter how many stops need to be made, it is generated on distance travelled only. Despite offering you the best price possible, you can be rest assured that the quality of service will not be altered. Our vehicles are sleek in their design and have many amenities that will make your journey more enjoyable. 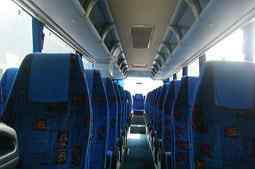 This includes GPS navigation, air conditioning, DVD/CD player, comfortable seating, on-board catering and even toileting facilities on our larger vehicles. If you are celebrating a big event, why not turn the vehicle into a ‘party bus’ and experience even more of an awesome time? Mention this requirement when you make your booking if this is something that appeals to you. We firmly believe that the experience that you have in the bus will be the stepping stone for the entire day/night, which is why we will always meet your requirements. You know everything about us, now let’s get onto the town that you will be visiting. Bournemouth is quite an underestimated town and there is lots to explore during your stay. If you are after quite an educational visit and want to learn more about the history of Bournemouth, Russell-Cotes Art Gallery & Museum is worth a visit. This beautiful piece of architecture is home to lots of statues, paintings and other item that will leave you enthralled for hours. Bournemouth Beach is one of the best in the UK, which is one of the main reasons why the town is a firm favourite with holiday makers around the world. There are many lovely hotels dotted around the beach, which means that you can really make the most of the gorgeous stretch of sand. ‘Oceanarium’ is an aquarium in Bournemouth and it’s a must go to location especially if you are travelling with young ones. There are lots of weird and wonderful creatures to check out and it’s reasonably priced too! If you are in the town for a stag/hen/birthday and are there to mostly explore the nightlife, you will not be disappointed. If you want to start your evening with a bite to eat, ‘Urban Reef Restaurant’ and ‘Indis’ are absolutely gorgeous depending on what kind of food you like. When it’s time to really party, there are many clubs that will cater to your needs. ‘Le Chic Bournemouth’ has banging music and some amazing cocktails, what more do you need? ‘Cameo’ nightclub is a big hit for stag/hen nights and you can even book your own private booth and get the VIP treatment all night long. Whatever you are doing in the town, the GPS navigation in addition to the driver and his knowledge will ensure that you get wherever you want to go. It is really easy to get in touch with us here on www.coachhirebournemouth.com. Simply enter your details into the enquiry form on the left hand side of the screen and a quote will instantly be emailed to you. This is something that no other minibus hire company offer as many take days to get back to you. If you like what you see, you can finalise your booking online or over the phone by paying a small deposit. Once you have paid your deposit, your details will be entered into our database. We will be at the meeting point 10 minutes before the agreed time, reliability is something that we pride ourselves on and we will ALWAYS be punctual. Your friendly driver will greet you before it’s time to hit the road. You can be satisfied that your driver is fully qualified and trained to the highest standard. He will also have extensive knowledge of the Bournemouth area, so can even advise you on places that are worth visiting, if he notices that you haven’t covered some really awesome places in your itinerary. Now that you know all there is to know about Bournemouth coach hire, what are you waiting for? We are the go to company if you require minibus hire in Bournemouth; we are professional and will make sure that you have an experience to remember for all the right reasons. Book our services today and you will not look back.